Grapeseed oil is often my choice for a basic body massage - it is light, has a slight nutty aroma, is easily absorbed and has good emollient properties. It is also easy to find and relatively inexpensive to buy.......this sometimes has to be a consideration! You can always add other carrier oils to improve richness if you want......avocado oil is terrific for dry, mature skin and should be used diluted as it is very heavy. This carrier oil is extracted from the seeds of grapes.......usually wine grapes! Grape seeds are usually thrown away as part of the wine making process, but the extraction and sale of grapeseed oil is an efficient use........as well as a profitable sideline! I like the idea of this, especially as I live very close to fantastic wine regions in South West France. If you are concerned about nut allergy reactions then grapeseed and sunflower oil are good choices because they are pressed from seeds. Pale green, light and thin with a slightly nutty scent. It is mildly astringent and helps to tighten and tone the skin.......great for oily skin and acne. Grape seeds contain proanthocyanidins, which are considered to be very potent antioxidants, helpful for diminishing the sun's damaging effects......also good for healing wounds. 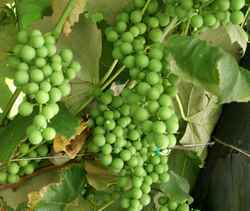 Grapeseed has wonderful skin moisturizing properties. Good for basic body massage. Inexpensive, but has a relatively short shelf-life of 6 to 12 months.